Coming from Italy, Soul Seller has had their share of starts, stops, and personnel changes since forming in 1999. But now clearly on the path of (traditional) melodic hard rock, the deliver their second album, appropriately titled, Back to Life, out on Avenue of Allies label. Soul Seller's sound is straight out of Eighties melodic rock which, while nearly passe in my native America, still finds popularity in the larger European arena. Their songs can be hard driving like Keep On Moving, which features Oliver Hartmann in duet, New Power Day, and Rock Still Stands. There's an air of AOR wthin both Old Hero's Prayer and the fine All I Can Promise. That latter song along with Wings of Freedom and Hell of Tears, the closest thing to a ballad, offer a sweeping arena sound. Then there's the strangely titled A Message from Planet Venus which offers simple and straight forward melodic hard rock. Above right: Soul Seller looking stylish on the road in Italy. It's also an example of Soul Seller's possible dilemma: sometimes their songs can seem derivitive rather than refreshing revivals of this classic genre. Yet, listening to the following cut, New Power Day, a brisk, heavy, and rocking number, you know that Soul Seller has a real fire inside their belly for their craft. 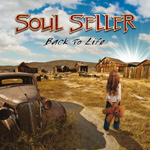 Soul Seller's Back to Life is a fine entry into the European melodic hard rock tradition. Strong talent and good song composition propels the album and should lead to future success. Recommended. Paradise Inc.'s debut, Time, rings true for melodic hard rock and entertains with impressive results. Very recommended.